Add depth and spaciousness to a room with a mirror created by Dulles Glass & Mirror. This oval mirror features a carefully crafted 1-inch polished bevel. 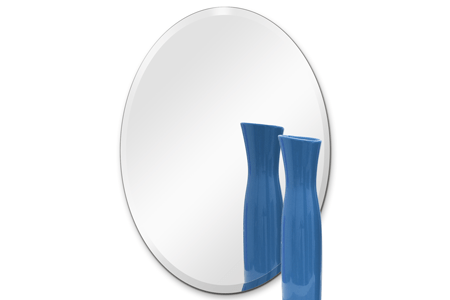 Each mirror is made of durable annealed glass with safety backing. With Hooks (Option): If this option is purchased, included are three hooks that allow the mirror to be fastened to drywall, studs, or wood. Having three hooks gives you the flexibility to hang this mirror horizontally or vertically. This beveled oval mirror has its edge carefully cut and polished with a 1-inch angle, thin on the outer edge, then increasing gradually to one inch. With Hooks Included: When attached to the wall via the provided clips the outer surface of the mirror sits about 1/2" from the wall. No Hooks Included: This mirror does not come with attachment hardware, you can attach this mirror with clips that fasten around the edges or mastic. Your choice of attachment needs to be purchased separately. This beveled mirror has its edge carefully cut and polished on a 1-inch angle. This mirror has a safety backing. It means that if your mirror breaks, it will not shatter and leave the dangerous broken glass. Instead, the mirror glass remains adhered to the safety backing. Your mirror will arrive with three hooks that are each 3 1/2" square. Each has a cross-like opening. Before hanging your mirror, you need two measurements—the distance from the center of one cross to the center of the other, and the distance from the highest part of the mirror to the top of the crosses. You then find the spot on the wall where you want to hang your mirror, keeping in mind its diameter. Mark the spot where you want the top of the mirror to be. Then measure down from that to the point that is the distance from the highest part of the mirror to the top of the crosses. From that point mark to the left and right the distance from the center of one cross to the center of the other, with half on one side and the half on the other. These two locations are where you put the screws. Shipping costs are determined by item size and/weight. 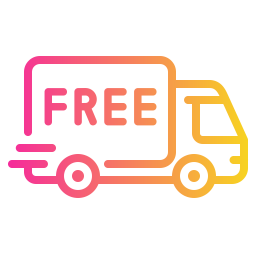 When your order is shipped, you will receive a shipping notification via email with a tracking number and a link to available real-time online order tracking. We do not ship to PO Boxes or APO/FPO Addresses. We also do not ship this item to Alaska and Hawaii. 22" x 30" 22" x 30" 24" x 36" 24" x 36" 22" x 39" 22" x 39" 24" x 48" 24" x 48"